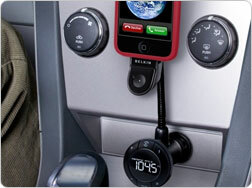 Belkin is coming out with two different devices to make it so that you can play the music from your iPhone through your car stereo. The issue with most other devices is that they work for the iPod and if you use them with your iPhone, you get that always charming interference. These two new devices allow for two different ways to run the music through your speakers. So no matter what type stereo you happen to have, you’ll be able to work it out so that you can enjoy the music on your iPhone. The less expensive of the two will cost you $70 and it works by utilizing a 3.5mm port. So it has a direct wired connection, but not all stereos have that port to plug into. Making the slightly more expensive option a great find for those with not so great stereos. The more expensive one is still only $10 extra at $80 a piece. It works by auto scanning for a free FM channel and then settles on the one that has the absolute least interference. The TuneBase Direct which is the cheaper of the two will start shipping out early this month and the TuneBase FM will ship mid-July. Getting rid of wires is always a perk, I’ve started wrapping a couple around my gearshift just to keep them out of the way.